Solutions for home settlement, slab settlement, and driveway settlement. Trotter Company is a full service foundation repair/stabilization contractor. No matter why your structure is settling, Trotter Company can stabilize it! With 80 years working in our red clay, Trotter Company is the most experienced foundation repair contractor in Georgia. We are the only contactor to offer a Composite Helical Pier as our standard pier. This pier offers the stability of a foundation provided by the helix and the rigidity of the large diameter pipe pier. The overall strength of our pier is reinforced with a concrete core. All major repair contractors are following Trotter Company’s lead and are promoting helical pipe piers. Backfill Settlement behind foundation walls can cause walls to bow or even collapse. Foundation walls that have been neglected and allowed to bow excessively will require Steel Beam Reinforcements. Some foundation walls may have to be completely demolished and a new reinforced foundation wall built to replace the failed wall. Landscape retaining walls that are leaning up to five inches may be stabilized with Helical Tie-backs. We also demolish and replace landscape walls that are past saving with reinforced, anchored walls. 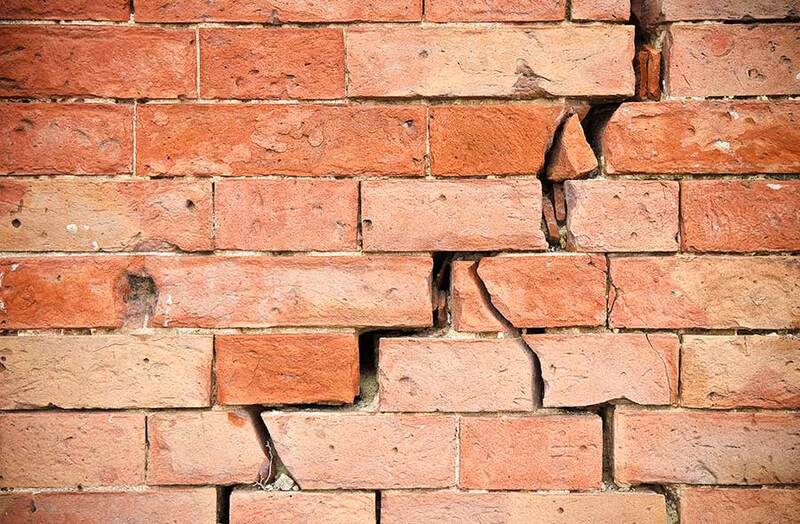 For permanent solutions from qualified structural repair contractors, contact Trotter Company. We offer free foundation & structural repair quotes in Georgia, including areas like Marietta, Atlanta, Decatur, and nearby. Foundation settlement warning signs can come in many different forms. From the interior to the exterior of your house, there are many different signs to catch an issue before it becomes worse. Save yourself time, money and headaches by spotting these symptoms early. It’s a good idea to do a routine check around the outside of your home at least once per year to make sure you can catch any issues before they become worse. Wall cracks, collapsing retaining walls, and a tilting chimney are all symptoms of a greater issue. Watch out for floor and wall cracks, as well as windows and doors that stick or are difficult to open. Only Trotter Company installs a reinforced, commercial duty, multi-helical pier as our standard residential pier, rated at over 50,000 lbs. Heavy wall couplers with quadruple bolts provide rigid connections between pier sections. Heavy wall steel pipe reinforced with 5000 psi concrete provides the strongest standard residential pier available. The solid core also prevents water flowing down the pier shaft. Large helical steel “footings” at multiple levels provide stable end barring foundations. Our Composite® Piers are completely installed and tested before they are attached to the foundation; this ensures that no additional damage will occur to your home during installation. Our floor stabilization system is heavy-duty and code compliant. Constructed with 5”x5” steel beams secured with heavy 3/4″ steel plates on top and bottom and 6″ flange beams, we use a 24”x24” 5000 psi concrete (that’s at least 480 lbs. of concrete per beam!) with # 5 rebar reinforcement placed on hardpan undisturbed soil to secure each beam. Rest assured, your floors will be stable with our system! Foundation failure can impact the structural integrity of your entire house and show warning signs on the inside of your home. 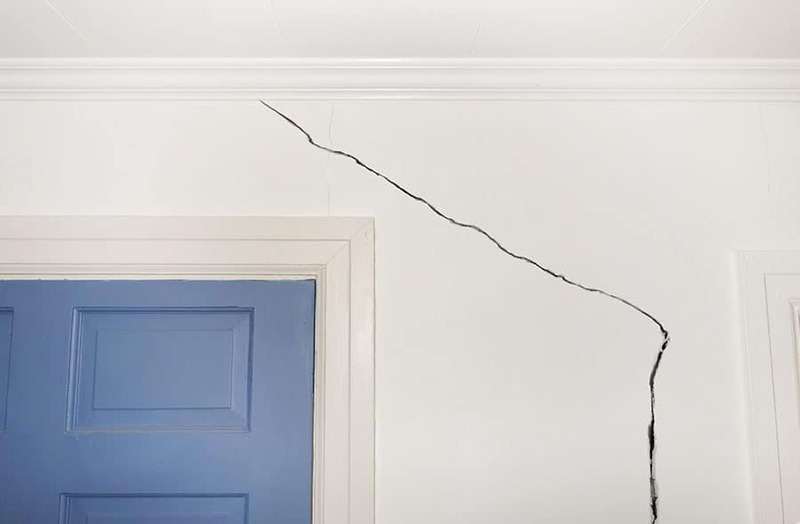 Typically, interior settlement cracks can be spotted stemming from the corners of doors or windows, with the crack slanting upwards and possibly growing wider near the ceiling. If the door or window displaying the crack is underneath another floor above, the top floor can experience even greater damage, most noticeably in the form of uneven floors or door/window jamming. Foundation issues can put pressure on your walls, causing them to bow or bulge. If you notice any of your interior walls starting to bow, it could be a clear sign of foundation issues. They can cause your doors and windows to stick or be difficult to open with the shifting of the weight. Floor cracks are one of the easiest symptoms to spot of foundation repair. If you notice any cracks in your basement floors, it could be a sign of foundation failure.